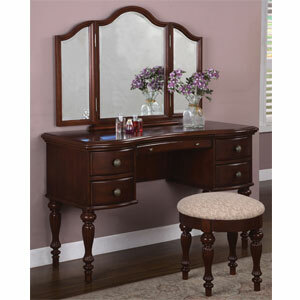 This Elegant Vanity Set Features Rich "Marquis Cherry" Finish With Inlayed Walnut Border On Top, Antique Brass Hardware, Graceful Fluted Turned Legs. The Vanity Drawers Are Lined In Plush Black, 100% Rayon Material. Tri-Fold Mirror Allows View From All Angles. Thickly Upholstered Round Bench Has Beige Tapestry Fabric, 48% Acrylic, 52% Polyester. Strong Construction. Some Assembly Required.